A mission to Mars could take a toll on astronauts' bodies, including their eyes. BANGALORE, India — NASA's Deep Space Network will provide support for India's Mars orbiter mission scheduled for launch this year as part of expanded cooperative ties between the United States and India, the two governments announced June 24 in New Delhi. "NASA is providing deep space navigation and tracking support services to this mission during the non-visible period of the Indian Deep Space Network," the governments said in a joint statement released during the three-day visit to India by of U.S. Secretary of State John Kerry. 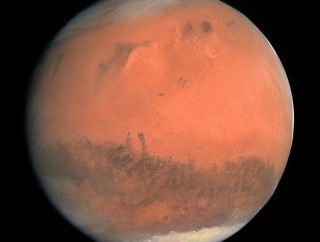 The Mars mission, developed by the Indian Space Research Organisation (ISRO) is slated for lift off from India's launch facility at Sriharikota in October or November. NASA and ISRO have also agreed to "explore further cooperation in such fields as planetary science and heliophysics, as well as potential future missions to the moon and Mars," the joint statement said. According to the release, the expanded cooperative plan, endorsed by the U.S.-India Civil Space Joint Working Group, includes "measures that will improve the use of earth observation data to promote sustainable development and the compatibility-interoperability between the U.S. Global Positioning System and the Indian Regional Navigation Satellite System." The statement said ISRO and NASA are also exploring the possibility of collaborating on a dual-frequency radar satellite, with the U.S. side supplying the L-band portion and India supplying the S-band portion, for Earth observation studies. ISRO would supply the spacecraft. The two countries also plan to engage in discussions on areas of mutual interest such as space situational awareness and collision avoidance as part of a Space Security Dialogue, the release said. Under a Scientist Exchange Program, two NASA scientists specializing in Earth observation will visit ISRO centers in 2013. India has also funded a fellowship program at the California Institute of Technology in Pasadena, Calif., under which an Indian student will pursue a master's program in aerospace engineering at the university.